Hyperthyroidism is a condition when thyroid ( a butterfly shaped gland in the neck) produces more thyroid hormone than needed by the body. It is a condition of overactive thyroid gland. Thyroid hormones regulate the metabolism of cells and controls the rate of how fast one burn calories and how fast our heart beats. High thyroid hormone levels in the blood stream is termed as thyrotoxicosis. Hyperthyroidism is more common in women than men. It is more common in people aged 60 and over. According to Ayurveda, hyperthyroidism is primarily a result of imbalance of Pitta as pitta is responsible for the functioning of thyroid gland. Some symptoms of hyperthyroidism are due to disturbance of Vatta dosha. The most common cause of hyperthyroidism is Graves' disease which is an autoimmune disorder which is also genetic. It is common in young females. 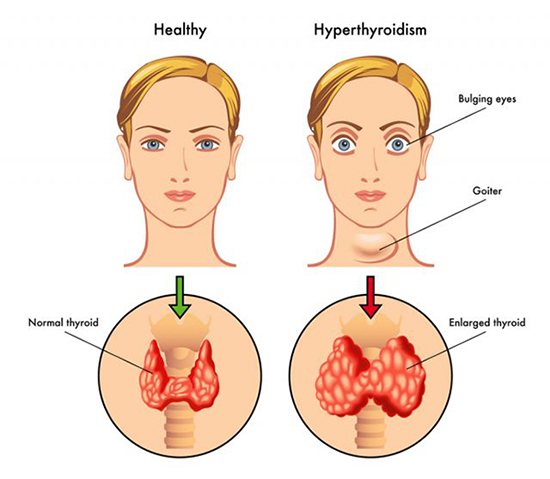 The second common cause of hyperthyroidism is thyroid nodules or lumps that gradually grow and increase the production of thyroid hormone. This is called toxic nodular or multinodular goiter. The third cause of hyperthyroidism is thyroiditis which is a condition caused by viral infection or improper functioning of immune system leading to leaking of stored thyroid hormone. Other causes are taking too much of synthetic thyroid hormone or consuming too much iodine. Hyperthyroidism accelerates the body's metabolism leading to sudden weight loss, irregular heart beat or palpitation along with sweating/perspiration and nervousness. Irritability, anxiety, restlessness, decrease in concentration and mood swings. Muscle weakness especially in upper arms and thighs and feeling of tiredness along with difficulty in sleeping. Skin thinning which makes skin look more smooth and velvety while hair become brittle and fine. In Graves’ disease , the eyes look enlarged or bulge outwards. There is puffiness around eyes. Swelling in neck due to enlarged thyroid gland also known as goiter. Medical history and physical examination can help in diagnosing hyperthyroidism. Blood tests can be done by the doctor to confirm hyperthyroidism. TSH level in blood is measured. Antibody screening , radio iodine uptake test and a thyroid scan can be performed. There could be red and swollen skin often on feet. Eye problems can develop like swollen eyes leading to blurry and double vision and even vision loss in some cases. If hyperthyroidism is left untreated, it may lead to thyroid storm which is a condition of high blood pressure leading to heart failure. Weak and brittle bones as too much thyroid hormone interferes with body’s ability to incorporate calcium into bones. Ayurvedic treatment aims to control the symptoms and prevent them from getting worse by restoring the imbalance of Pitta and Vata dosha. It aims at countering hyperthyroidism by clearing the channels and restoring the secretions and circulation of thyroxin . 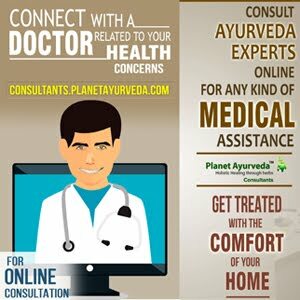 Planet Ayurveda offers the complete treatment of Hyperthyroidism in the form of "Hyperthyroid Care Pack." As the name suggests, this product is excellent in maintaining a healthy immune system. These capsules are a combination of 4 ingredients: Grape Seeds, Cow colostrums, Bhumi amla and Green tea. These capsules regulate the metabolism of thyroid gland and thus maintain the production of thyroid secretion. The ingredients are known to have antioxidant properties. The medicine detoxifies the liver and works as a health tonic. It improves mood by alleviating fatigue. Dosage: Two capsules two times a day with plain water after meals is recommended. 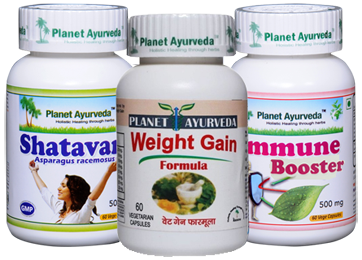 Weight gain capsules as the name suggest work towards reversing the weight loss which is a primary symptom of hyperthyroidism . This product is made up of standardized extracts of 8 herbs that includes Ashwagandha, Vidanaga, Triphala, Saunf, Pippali and Jeerak. The ingredient Ashwagandha itself is very beneficial in overcoming stress, constipation, fatigue, muscle weakness. It nourishes the brain and helps with other neurological disorders. It is an effective endocrine system modulator. It has anti-inflammatory properties that help in promoting overall wellbeing of body. This combination helps in supporting healthy digestive system. The combination helps in relieving menstrual cramps also. Dosage: Two capsules, two time a day with plain water after meals need to be taken. These capsules are made from herb Shatavari or Asparagus Racemosus. This medicine is beneficial to improve complete female health including female reproductive system. It helps in relieving symptoms like irritation, low energy, fatigue, restlessness, nausea, vomiting and nervousness. Shatavari boosts immunity. The medicine works in normalizing irregular menstrual flow and it supports healthy weight. The product has beneficial effects on mind as well as helps in maintaining Pitta balance. Regular intake of Shatavari capsules help in promoting hair growth. Dosage: Two capsules twice daily is advised to be taken with plain water after meals. Almonds and walnuts are very beneficial in treating hyperthyroidism. One needs to take coconut oil as it nourishes the thyroid and aids in metabolism. Coconut water is also good. Fruits like pears, apples, grapes, pineapples, melons, bananas, dates and peaches are good. Vegetables like cabbage, kale, carrot, pumpkin, spinach, turnips, mustard greens, cucumbers and brussels sprouts are helpful in reducing the overproduction of thyroid hormone. It is recommended to include milk and milk products in diet. One needs to take diet rich in minerals like zinc, copper and calcium and consume natural sources of iodine like sea weeds. Include more ginger in diet. Old rice, barley, oats, moong daal, bengal gram should be taken. It is essential to avoid smoking completely and also avoid stress to get better. The patients need to avoid alcohol and caffeine as much as possible as they aggravate the symptoms. Eating on time, sleeping on time are very important parts of treatment. Practicing Yoga (sarwangasana, matsyasana and halasana), meditation and pranayama (deep breathing) helps in overcoming hyperthyroidism. The best are Ujjayi pranayama and Shitali breath.